"Peace I leave with you, My Peace I give to you"
Our Gospel reading for this Sunday(John 14:23-29) is packed with meaning and food for meditation. In it, Jesus prepared his disciples for his leaving and told them the Father would send an Advocate - the Holy Spirit; then he gave them His Peace - the same Peace we hear in the prayer just before Communion during every Mass. "Jesus said to his disciples: 'Whoever loves me will keep my word, and my Father will love him, and we will come to him and make our dwelling with him. Whoever does not love me does not keep my words; yet the word you hear is not mine but that of the Father who sent me. 'I have told you this while I am with you. 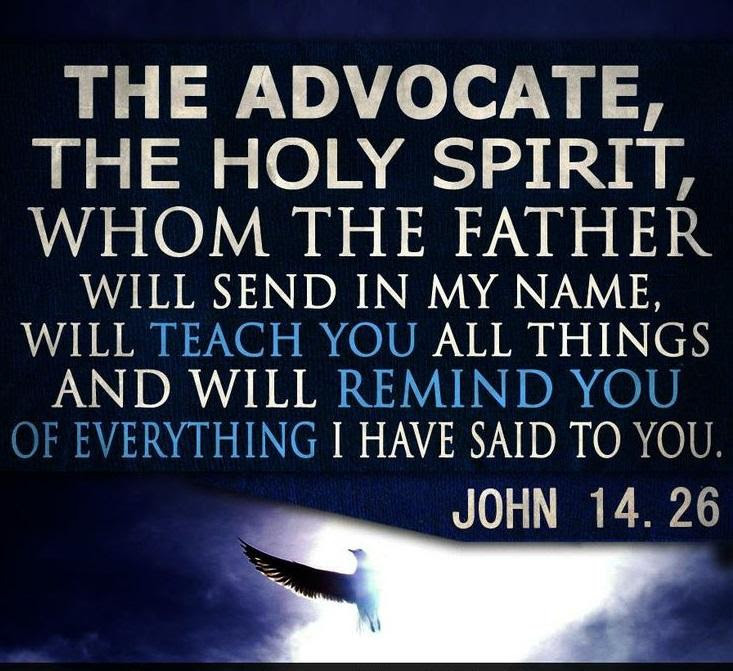 The Advocate, the Holy Spirit, whom the Father will send in my name, will teach you everything and remind you of all that I told you. Peace I leave with you; my peace I give to you. Not as the world gives do I give it to you. Do not let your hearts be troubled or afraid. You heard me tell you, 'I am going away and I will come back to you.' If you loved me, you would rejoice that I am going to the Father; for the Father is greater than I. And now I have told you this before it happens, so that when it happens you may believe.'" In our first reading (Acts of the Apostles 15:1-2,22-29), we hear of a struggle in the very early Church between the forces of traditionalism and inclusion. It was settled by the Council of Jerusalem about 50 AD. The decision by the Holy Spirit and the whole church was that Christ's Church was to be open to all (universal / catholic) and the Gentiles did not have to adhere to Mosaic law. Our second reading (Revelation 21:10-14, 22-23) was written in the midst of the persecutions of the latter 1st century, after the destruction of Jerusalem, to Christians who sorely needed reassurance that God would prevail. John's vision was of the end times when a "new Jerusalem" would descend from heaven and God would indeed prevail. "The angel took me in spirit to a great, high mountain and showed me the holy city Jerusalem coming down out of heaven from God. It gleamed with the splendor of God. Its radiance was like that of a precious stone, like jasper, clear as crystal. It had a massive, high wall, with twelve gates where twelve angels were stationed and on which names were inscribed, the names of the twelve tribes of the Israelites . . . . The wall of the city had twelve courses of stones as its foundation, on which were inscribed the twelve names of the twelve apostles of the Lamb. "I saw no temple in the city for its temple is the Lord God almighty and the Lamb. The city had no need of sun or moon to shine on it, for the glory of God gave it light, and its lamp was the Lamb." Just as John had reassured the early Christians during a time of great distress, Jesus reassured his disciples in the time of their impending distress. That message of reassurance has lost none of its meaning today. In our times of distress, whatever they may be, we have only to look to the reassurance of Jesus himself - "Let not your hearts be troubled or afraid" - "My Peace I give you" - "The Father will send you an Advocate". And, we have only to trust and believe it to be.